The authors explore public debt along two distinct but complementary analytical paths. One path concerns microeconomic aspects of public debt as it emerges through budgetary processes where individuals respond to the costs and gains of different courses of action. The other concerns the systemic properties of rational individuals acting within a democratic system of political economy. Within this scheme of thought, the two levels of analysis are integrated by recognition that efforts to control macro-level outcomes must address the micro-level circumstances and conditions that promote public debt as systemic budgetary outcomes. Scholars and students, as well as policy makers in public debt and political economy, will find this critical resource invaluable to understanding this vital issue. Over the past few decades, economists have witnessed with growing uneasiness their failure to explain the ballooning of public debt in most countries. Using methodological individualism and micro-economics, this book overcomes flaws inherent in the standard macro approach, according to which governments manipulate public debt to promote systemic stability. This unique analysis is grounded in the writings of Antonio de Viti de Marco, injecting current analytical contributions and formulations into the framework to offer a forthright insight into public debt and political economy. Public Debt provides an alternative orientation that explains why concepts of public debt that are relevant for authoritarian regimes are not relevant for democratic regimes. It examines public debt in cooperative and monopolistic democracies as well as the corrupting quality of public debt in democracy. Including topics such as macro guidance within a Machiavellian approach, public debt as systemic lying and as a shell game, economy as an ecology vs. economy as an engine, individual vs. group action and cooperative state as ideal type, this book is a unique and refreshing approach to the material. This comprehensive and cohesive sourcebook will serve as a critical resource for academics interested in public debt and political economy. 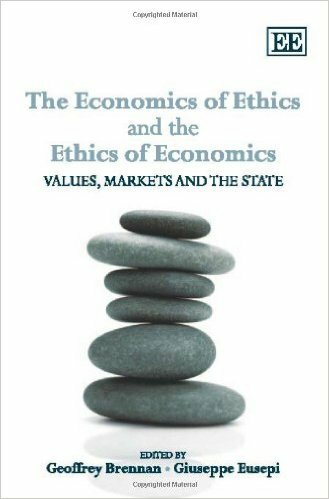 This book makes a rational and eloquent case for the closer integration of ethics and economics. It expands upon themes concerned with esteem, self-esteem, emotional bonding between agents, expressive concerns, and moral requirements. Economists have long assumed that `value' and `price' are synonymous and interchangeable. The authors show how disregarding this false assumption and adopting an interdisciplinary approach could improve the economics profession by distinguishing economic values from ethical values. Replete with discussions that will challenge conventional economics, this book offers a corrective argument against the rigid separation of agents' motivation and the purely normative aspects of economic analysis. The various contributions explore the different dimensions at the frontier between the rational and the moral in political economy, ethics and philosophy. Containing a variety of cross-border analyses, this innovative book will be a must-read for economists, political scientists and philosophers. It will also be an invaluable resource for students in the fields of economics and philosophy. Beyond Conventional Economics presents new original work from leading scholars on the interface between the individual and political and social institutions. The book offers a critique of the inadequacies of the conventional economic approach to politics and a state-of-the-art view of new paradigms challenging the dominant economic notion of the individual. A number of chapters also explore the limits of individually rational behaviour in political decision making – some by challenging the orthodox content of the idea of rationality, others by providing fresh views on the operation of political processes. This book is a must-read for anyone interested in understanding individual behaviour under limited rationality. 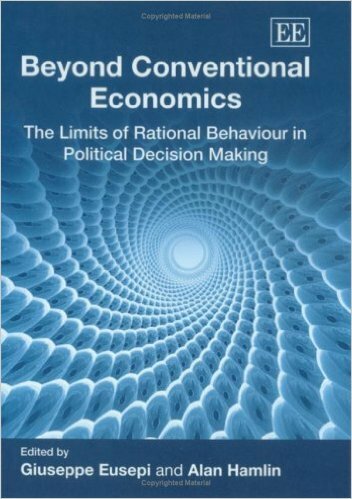 Thought-provoking and enlightening, this is a unique book documenting a meaningful debate on the limits of rational behaviour inside public choice circles and will appeal to a wide audience of economists, political scientists and public choice scholars. This book provides a comprehensive analysis on the design of institutions for the new Europe. Addressing critical issues such as the appropriate distribution of political powers, the next step in the constitution process, allocation of taxing powers and distribution of policy-making responsibilities. This book makes a valuable, analytical contribution to recent debates on the ongoing institutional changes occurring within the European Union. It provides a comprehensive and diverse insight into a variety of areas, including in-depth studies of fiscal, monetary and voting issues, to help elucidate the current period of transitional change.